Anti-gunners continue to claim that mass shootings don’t happen in other countries, despite recent history to the contrary. They look at what happened in Toronto as an anomaly, something that happened as an outlier but isn’t really a thing to worry about. They ignore it and pretend that it doesn’t completely undermine their arguments. What will they do with a second mass shooting in the Great White North? 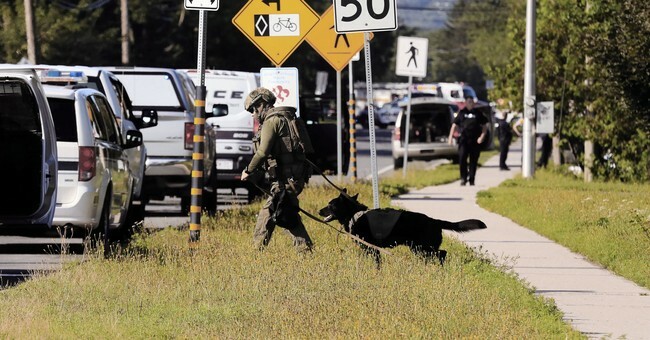 At 7:10 a.m. AT Friday, officers Lawrence Robert Costello and Sara Burns of the Fredericton Police Force responded to reports of shots fired outside a local apartment building. Upon arrival, they found two people on the ground. When Costello and Burns approached the victims, they were fatally shot. Police locked down the area and set up a perimeter. At some point, police and the suspect exchanged gunfire. Around 9:30 a.m, about two hours after the initial call, police entered an apartment and arrested a 48-year-old suspect, who was taken to hospital with serious injuries. The incident unfolded at a north-end apartment complex on Brookside Drive. Four fatalities in a single location. That’s a mass shooting, by definition. But those only happen in the United States, right? Of course not. They happen everywhere. The difference is ours are publicized as mass shootings, and we spend all our time in the media talking about them and this supposed epidemic of school violence or whatever and pretend that other countries are somehow immune. Canada has yet another mass shooting despite their myriad gun laws or their mistaken idea that firearm ownership isn’t a civil right. All the laws they currently have stopped nothing. Four people are dead, including two police officers, and I have little doubt that the weapon used will be vilified rather than the individual pulling the trigger. They’ll talk about how they need more gun control up there, but they’ll never get that the problem is with people, not guns. Meanwhile, our flavor of gun grabber will ignore this one just like they did Toronto. They’ll pretend it doesn’t undermine everything they’ve been claiming, that a handful of gun laws will stop mass shootings despite all of those laws being in effect in Canada. They’ll stick their fingers in their ears and sing “la-la-la-la-la-la-la-la-la-la-la-la-la-la-la” all day long rather than face the fact that their policy proposals have already proven to be failures. Well, the truth is what it is. It doesn’t require their acknowledgment to still be the truth. And that truth is why we’re not giving a damn inch to the gun grabbers. Even if it wasn’t a sacred and protected right, we’d still fight for gun ownership because the alternative has been proven to be a complete disaster. If gun control doesn’t work, why bother with it in the first place? Of course, since the right to keep and bear arms is a constitutionally protected right, we’ve got even more reason to fight. Especially since the claim that mass shootings don’t happen in other countries has been shown to be complete crap.